Hedgehogs – very tasty meatballs made of rice and minced meat. They combine the taste and meat and vegetable dishes. Hedgehogs are pretty easy to prepare. 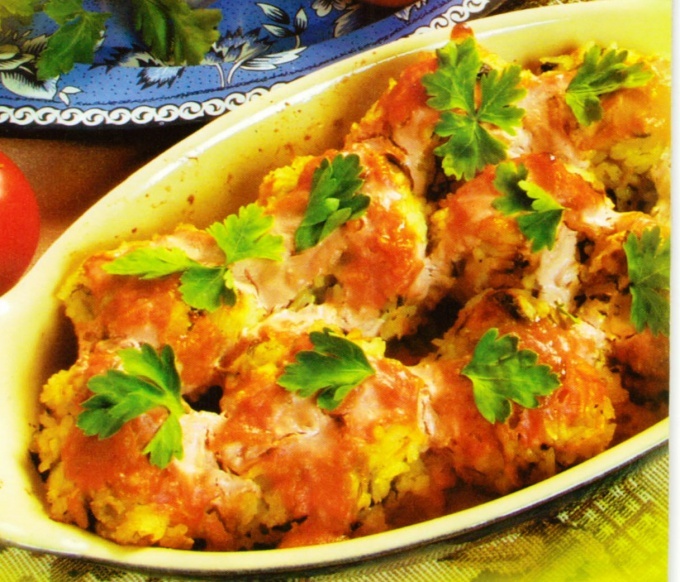 Perhaps the most difficult part is to choose what kind of meat to make meat balls with rice. It is usually cooked with pork, beef and chicken. Various combinations are also welcomed, while the proportions may be at their taste preferences. The first method of preparation involves the use of cooked rice. Prepare minced pork and beef. With meat, remove the film and tendons. Then loop through a meat grinder. Peel the onion and cut it into pieces. Onion along with the beef mince. This will add juiciness to the meat. On a coarse grater grate the carrots. Finely chop the second onion. In vegetable oil fry onions and carrots. Pour in the pan glass of rice. Rinse it under running water until the flowing water is no longer cloudy. Boiling water pour rice and boil until soft. In a large bowl, mix beef, cooked rice, roasted carrots and onions. Pepper and salt to taste. The resulting mixture mix well. Soaked in cold water with your hands take pieces of meat and form small balls 20-30 grams each. Balls lay in a deep skillet so that they do not touch each other. In a bowl mix ketchup with mayonnaise, add a small amount of water. Sauce pour the cooked hedgehogs in the saucepan so that they were hiding only half. Cover the pot or close obtyanite foil. Put in the oven. Ten minutes until cooked remove the lid to brown the patties. Hedgehogs can be prepared using raw rice. For this stuffing, which is passed through a meat grinder, along with chopped onion, add a glass of clean dry rice. A mass of stir fried carrots and onions. Add pepper and salt to taste. Make round patties. In a hot pan quickly fry them to a crisp. Place in a deep saucepan. Hedgehogs pour two cups of beef broth. And add two tablespoons of tomato paste, three Bay leaves, five peas of black pepper, two cloves of garlic, crushed with salt. If necessary add water. The liquid should completely cover the tent. Saucepan put on a small fire. Within thirty minutes to simmer, covered. When you buy ready minced meat, keep in mind that a quality product will not cost less than fresh meat. Grinding meat choose with fat, so the dish will be more juicy.